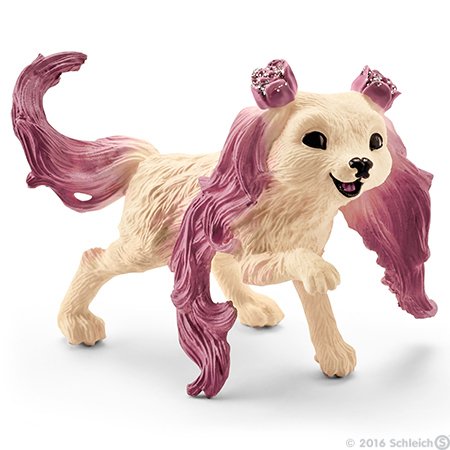 Feya's Rose Puppy Figurine from Bayala series. Made by Schleich in 2016. Brand new, never used or played with. Figurine is loose without packaging with original Schleich tag and is 2 1/2 inches long by 1 1/2 inches tall. Feya’s puppy can already do a few amazing tricks. Feya loves her little puppy. She brushes her every day and weaves little rose petals into her fur. They often frolic around on the meadow outside Feya’s house. When the puppy has had enough, Feya puts her on her lap and strokes her. When the elf rides out with her friend Eyela, the little puppy usually sits on her arm or in a well-padded saddlebag. But sometimes she prances wildly between the legs of the horses. In the evening, she sleeps in Feya’s bed and keeps her feet warm.